are proudly made in the U.S.A. in the same Italian tradition of cheesemaking that has made Galbani Italy’s favorite cheese brand. Galbani Thick Sliced Mozzarella is a soft, creamy cheese that can add natural Italian flavor to a regular sandwich. The thick slices are perfect to spice up a traditional sandwich or add bold flavor to even the best recipes. Galbani Thick Sliced Provolone is a perfect match for any sandwich or meal bringing enough Italian flavor to any dish. The thick slices are perfect to spice up a traditional sandwich or add bold flavor to even the best recipes. Galbani Thick Sliced Asiago is a sharp Italian cheese that is packed with enough zest to make sure every dish is filled with flavor. The thick slices are perfect to spice up a traditional sandwich or add bold flavor to even the best recipes. 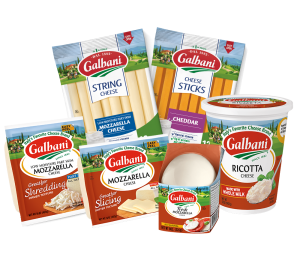 Galbani Thick Sliced Mozzarella is a soft, creamy, cheese that can bring bold Italian flavor to sandwiches, snacks, and your favorite dishes. Galbani Thick Sliced Provolone is a perfect match for any sandwich or meal bringing big Italian flavor to your favorite dish. Galbani Thick Sliced Asiago is a sharp Italian cheese that is packed with lots of zest, making every dish full of bold, Italian, flavor. 8 oz., 16 oz., 32 oz., 5 lb. Available in both Whole Milk and Part Skim varieties, Galbani® Slicing Mozzarella is delectable and has a softer texture which makes it the perfect for slicing and snacking. That's why it's the top choice for your favorite sandwiches and appetizers. 12 oz., 16 oz., 32 oz. Available in both Whole Milk and Part Skim varieties, Galbani® Shredding Mozzarella has a creamy taste and a firmer texture, which makes it the ideal cheese for shredding. Sprinkle some on your next homemade pizza, or add some to any soup for an Italian twist. Galbani® Reduced Fat Mozzarella provides you that great mozzarella taste you love, but with 40% less fat and 10% fewer calories per serving, than Whole Milk Mozzarella. Galbani® Grated Parmesan cheese has a strong, savory, flavor that makes it perfect for topping pasta, soups, salads, and much more. Use our new grated Parmesan cheese to put an exclamation point on all of your favorite recipes. Galbani® Grated Romano cheese has a sharp, creamy, flavor that makes it perfect for topping your favorite hot and cold dishes. Galbani Romano cheese makes it even easier to capture the authentic taste of Italy with any meal. Galbani® Asiago & Parmesan blend shredded cheese is a full-flavored, sharp, shred blend which is sure to make any recipe stand out. Our shred blend is a mix of some of the best Italian flavors to really help make your dishes extraordinary. Galbani® Classic Ricotta is made with just 3 simple ingredients: milk, vinegar and salt. The true Italian taste and creamy texture of Galbani ricotta cheese is perfect for lasagna, stuffed shells, pizzas, cannolis and more. 15 oz., 32 oz., 48 oz. Ideal when you're looking to make an extra-creamy lasagna, a decadent cheesecake or cannolis. Galbani® Whole Milk Ricotta adds a rich flavor your family is sure to love. Galbani® Part Skim Ricotta is ideal for your favorite lasagna or stuffed shells recipe. The extra creamy taste makes it a delicious addition to cakes, muffins, and pancakes. Galbani® Fat Free Ricotta is the perfect choice when you're looking for flavor and a fat free alternative. Galbani® Low Fat Ricotta is a delicious substitute for cottage cheese and is a good source of calcium. Of course, it's great in lasagnas, too. 12 oz., 16 oz., 24 oz. This delicious, nutritious, low moisture part skim mozzarella string cheese is a great snack for any time or place. Kids love the taste, too. Crafted using 100% USDA certified Organic milk, this deliciously simple snack is sure to satisfy anyone’s craving for organic string cheese! Individually wrapped so you can take a nutritious cheese snack anywhere you go. High in calcium, and 25% less fat than low moisture part skim string cheese. A favorite of kids and adults. A delicious mix of Colby and Monterey Jack cheese in one convenient snack. America's favorite cheese was never so easy to enjoy. These ultra-convenient cheddar sticks are great for lunchtime and on-the-go snacking. These pepper jack cheese sticks are rich, delicious, and deliver just a little kick. Enjoy your choice of cheddar and colby jack cheese anytime, anywhere with this individually wrapped variety pack. This whole milk low moisture mozzarella string cheese is made from whole milk and packed with 7 grams of protein. This whole milk low moisture string cheese is a tasty, portable snack for people on the go. The fresh, creamy taste of Galbani® Fresh Mozzarella is a great addition to salads, soups and pizzas. On top of a salad, on a panini, or as an hors d'oeuvre, Galbani® Fresh Mozzarella is a culinary delight. Delicious cherry-size balls make it more convenient than ever to serve fresh antipasti platters, appetizers, and salads. Enjoy the soft and moist texture of Fresh Mozzarella in a conveniently pre-sliced log with ready-to-use pieces. With this convenient easy pre-sliced log, adding the fresh, creamy taste of Galbani® Fresh Mozzarella to salads, soups and pizzas has never been easier.